Before starting, I'm a grad student without formal training in bioinformatics so I've mainly learned from online forums. That being said, if this question is stupid or I'm missing critical information, don't hold back. 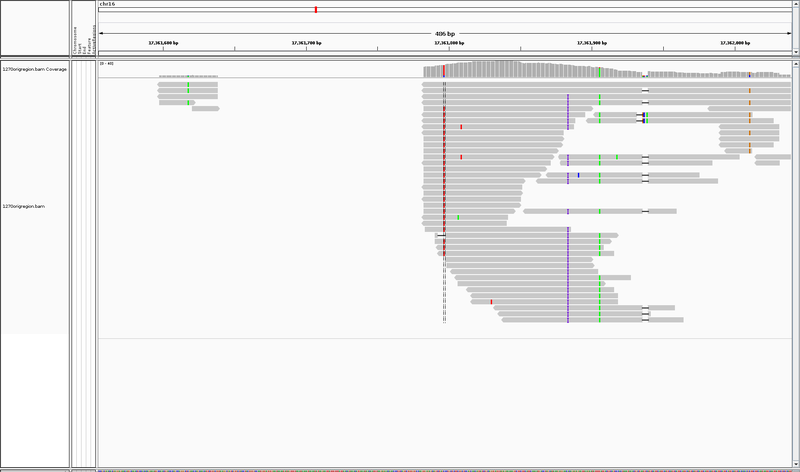 I have an issue similar to this thread http://gatkforums.broadinstitute.org/gatk/discussion/5638/incorrect-missing-genotypes-using-haplotypecaller but it doesn't appear to be a data quality issue as was seen there. I followed the best practices workflow using GATK 3.7, although I omitted base quality score recalibration. 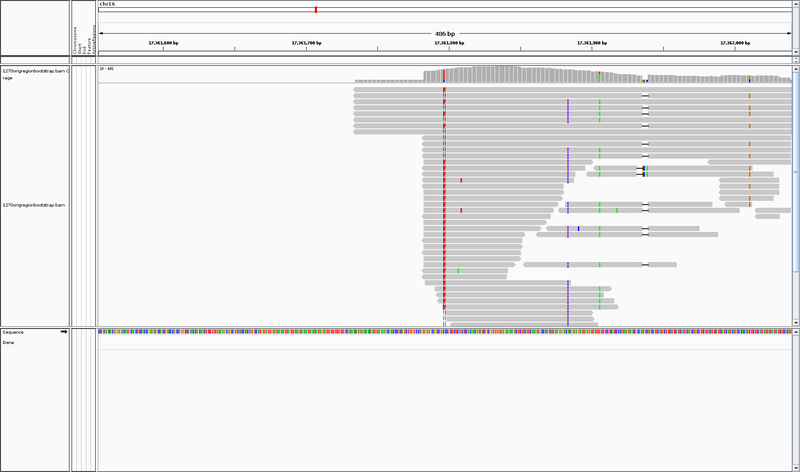 I have a a combination of WGS and WES and 21 samples for which I generated gvcf files and then genotyped concurrently. I noticed that occasionally single samples would be called ./. in regions where every other sample is 1/1. I focused on one of these oddities and went to the single sample that was causing the problem. Sample 1270 is the original bam that is called improperly while 1271 is called properly. Sample 1270 has 40 alternate reads and 0 reference reads. The region (-L) is the surrounding gene from the region list I used on the whole genome data although this sample specifically is from an exome capture. This looks odd as the "ArtificialHaploytypes" (the top 4 reads) generated do not contain the variant. The remaining 24 reads are from the sample. It seems that the caller is pulling the DP of 40 from the original file but for some reason calling it reference. 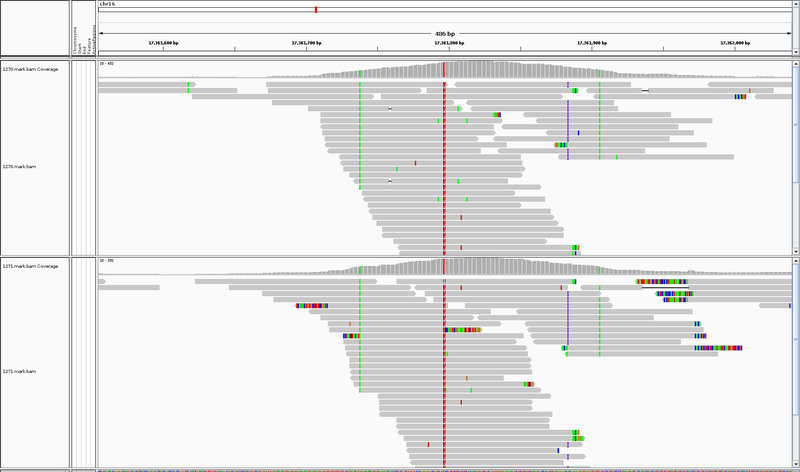 If I do a traditional multisample haplotype caller using the 1270 and 1271 shown above, it will call both properly. However, if I call g.vcf and the genotype them it misses the call in 1270. If I call 1270 in the standard mode it also misses the call. The base qualities and mapping qualities in the region seem to be fine, with the caveat that I didn't recalibrate scores. If anyone has any experience with this, tips for troubleshooting or needs more information, please let me know. Hmm, that is odd, and interesting. Can you just check if you get the same results with the latest nightly build? HC from the nightly build (GenomeAnalysisTK-nightly-2017-04-06-g34bd8a3) gave the same results in both default and GVCF modes. However, I tried both the nightly and the stable 3.7 with the region (-L) set to the 200 bp immediately surrounding the missing snp. This seemed to select a different active region that didn't truncate the ends and correctly called the snp. However at a 250bp region and a large 100kbp region, the initial problems recur. Can you submit a bug report so I can take a look locally? If so instructions are here. I submitted the bug report today, the file is called sgrzegor.tar.gz and should contain everything needed to replicate the error. Thanks. I will take a look soon. Sorry for the delay. I tried with the latest version of GATK, and I did not see the site present in the output from HaplotypeCaller in normal mode or in GVCF mode? No worries about the delay. Do you mean you don't see the variant present at 17361797 in the HC output? 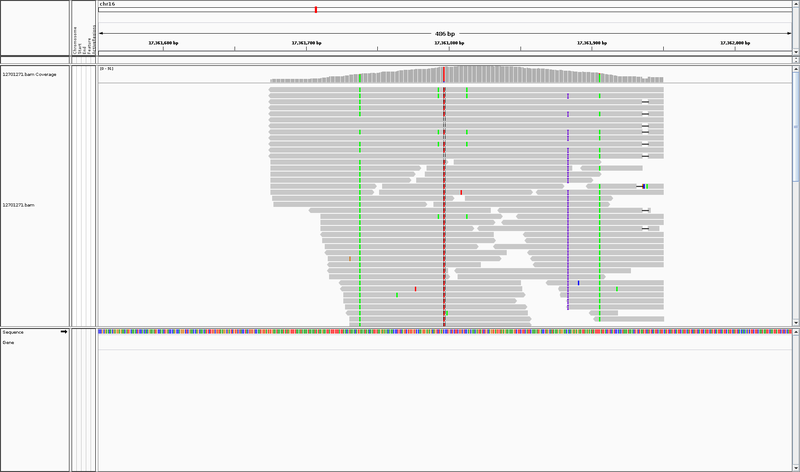 That's the problem, in the raw reads it seems there is a SNP with roughly 40x coverage of the alternate allele, but haplotype caller seems to be saying its reference at that location. My apologies if I'm misinterpreting your statement. Ah, I see. I did think the issue was the contradiction between the GVCF and VCF. However, on second look, it looks like an issue with the assembly. If you add either --forceActive or --allowNonUniqueKmersInRef to the command, the site is called 1/1. Ahh okay. That makes sense, so i imagine this is due to the high duplication rate in our models genome? For processing large groups would either of these commands be more reliable in terms of accuracy and/or runtime? I know there was some chatter about making --allowNonUniqueKmersInRef the default in highly repetitive regions, but there has not been a definitive decision made on that yet. The major issue is that it could introduce false positives and take up a lot of compute. I think if you know the regions where the genome is repetitive, it is worth adding the flag.